It’s great to see you all here this morning – thank you so much for coming. I’d like to begin by sincerely thanking Stefan and Bulthaup for inviting me to present my work here as part of the Contact Photography Festival. It’s been great fun hanging out with Stefan over the past few days in preparing for this morning. As I’ve got to know him a bit better I’ve learnt he has a real passion for photography and fine art. He’s a collector himself and is genuinely committed to supporting artistic endeavor and in making this space available for showing new work. Stefan, your encouragement is hugely appreciated. I’d also like to thank Naomi and Elyse Clinning from Kriss Communications for all their hard work and encouragement in putting this whole thing together. Just to add that Naomi has been a great source of inspiration, wisdom and support to me over the years I’ve been based in Canada, for which Naomi, I am sincerely grateful. It’s also a great pleasure to welcome Alex Bozikovic here this morning. Alex is the architecture critic for the Globe and Mail and is a prolific writer and thinker about architecture and urban life in Canada and beyond. Rigorous public discussion is so crucial to how we design and make our cities, and in particular how we keep our architecture grounded and relevant to the people who use it. What I admire in Alex’s writing is the way he views architecture and urban design through this human prism, and it’s a great privilege, Alex, to have you here to share thoughts on photography today. 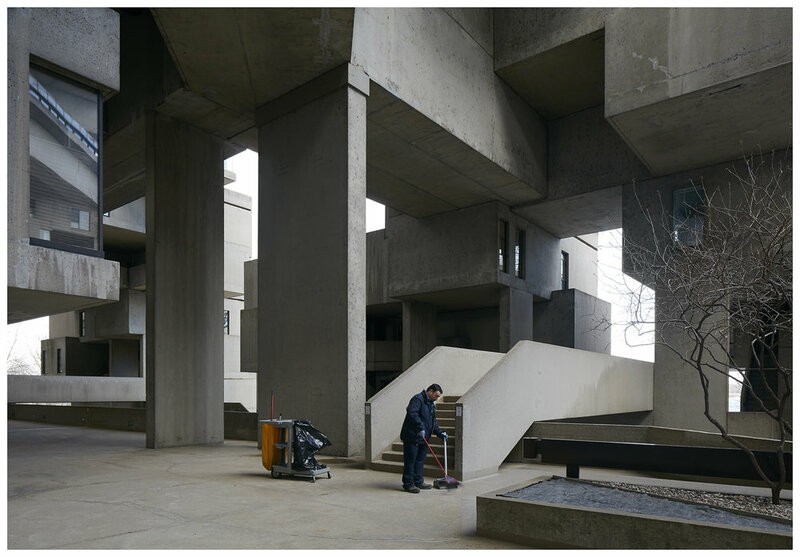 Revisited: Habitat 67 – some of which is on the walls here – is a series of photographs I’ve made at the residential complex in Montreal, designed for the world fair in 1967. I began the work because I wanted to thoroughly review my own photographic practice and think more deeply about the way in which we present architecture in photographs. So in approaching this extraordinary piece of architecture I’ve been less interested in its formal qualities - though of course the complex is formally breathtaking - and more in seeing if there were other ways to look at the building that might reveal clues, or a the beginnings of a new blueprint for communicating architecture in photographs. To step back for a moment, I’ve been photographing architecture on commission for almost 20 years and it’s been my perception for quite some time that much of mainstream architectural photography – in which I myself am of course implicated - is somehow stuck at a crossroads. Over the last few years, there’s been an incredible explosion of image sharing on the web, and a massive growth in social-media and websites dedicated to covering architecture and design. We‘re bombarded today as never before by a tsunami of digital imagery of architecture. In many ways this can be seen as a good development. We are now instantaneously aware of new projects as they emerge from all over the world. The web has undoubtedly brought previously unimaginable capacity for sharing thoughts, ideas, and images. However, I think it also has had some less positive effects. Not all, but a good portion of contemporary imagery of new architecture is beginning to look and feel the same. It has always been somewhat like this, since architectural photography has from the start had its own distinct language. This can be very broadly explained by two viewpoints - the single point perspective to show elevation, and the ¾ point view to show volume. Both originate from the language of architectural drawing that was used prior to the invention of photography in the mid nineteenth century, and then adopted by early photographers recording buildings and cities. In the language of architectural photography today, these two key viewpoints are still very present. But the proliferation of imagery on the web has sped everything up and seems to be having a homogenizing effect. For instance. Buildings and spaces are today mainly presented in a manner that is impossibly clean and tidy. Views are also generally presented in wide format. Skies are mainly shown blue. There’s a proliferation of images captured at dusk – helpful for hiding awkwardness in architectural finish, but strangely disconnected from regular day-to-day experience. From time to time there may be a blurry figure or two wondering around in the frame – but when people are included in photographs they often seem either on auto-pilot, or looking like figures placed in a digital render. The result is two-fold. First, the overall effect is a feeling of detachment. The photography often feels lacking in life and soul, with an almost super-real quality about it. Polished certainly, but not grounded in anything that can be related to on a human level. As an additional observation, there’s been a blurring of the lines between digital render and photograph. It’s sometimes almost impossible to tell whether an image is a digital mock-up or has been captured on site. The second result I think is that the projects themselves, the architecture itself, is in danger of looking and feeling the same. Over-polished imagery can make architecture itself difficult to decipher – almost as if the buildings are merging into one-another. The question I therefore ask myself as a photographer. Is it possible to photograph architecture usefully, informatively and with relevance - both to our own profession and to a wider audience? And if so, how do we do this? For my own response and for inspiration for my project at Habitat 67, I began by looking back at images by photographers and artists I’ve admired. Wall is a fine artist based in Vancouver who regularly uses the built environment as canvas for exploring his ideas. This image is entitled The Destroyed Room. 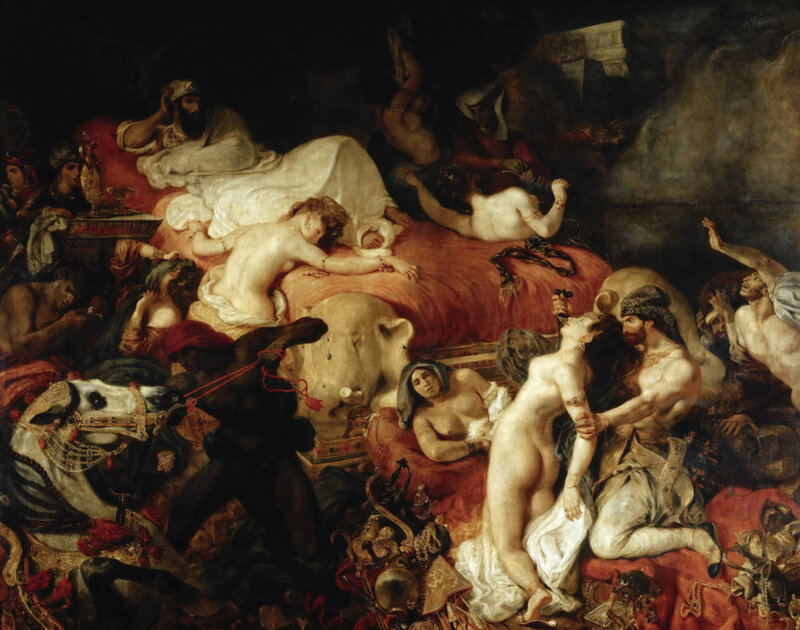 Wall has said the picture emerged from his encounter with a painting by Eugene Delacroix, called The Death of Sardanapulous. Made in 1827, Delacroix’s painting depicts the Assyrian monarch on his deathbed, commanding the destruction of his possessions and slaughter of his concubines in a last act of disobedience against invading armies. 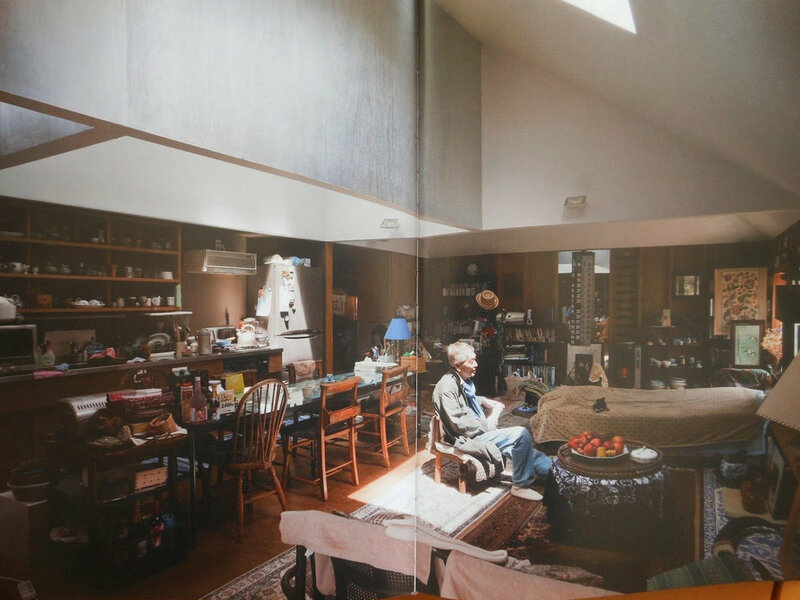 I see Wall’s Destroyed Room as helpful for thinking about photography and architecture for 3 different reasons. First, it reminds me that an interior does not need to be tidy and clean to be beautiful. The current visual language we adopt to photograph architecture urges us to clean up beforehand – to remove signs of life, to remove dirt, marks and visual distractions. Sometimes on commission there are good reasons to simplify a view by moving things around – particularly if clutter is distracting from the communication of the design intention. But is it always necessary? This slide is from a shoot I did a few years ago in London – the image on the left was the room as found, the one on the right, the curated final view. Unfortunately I wasn’t able to find the provenance of this photograph, but it was first shown to me by an architect practicing here in Toronto. 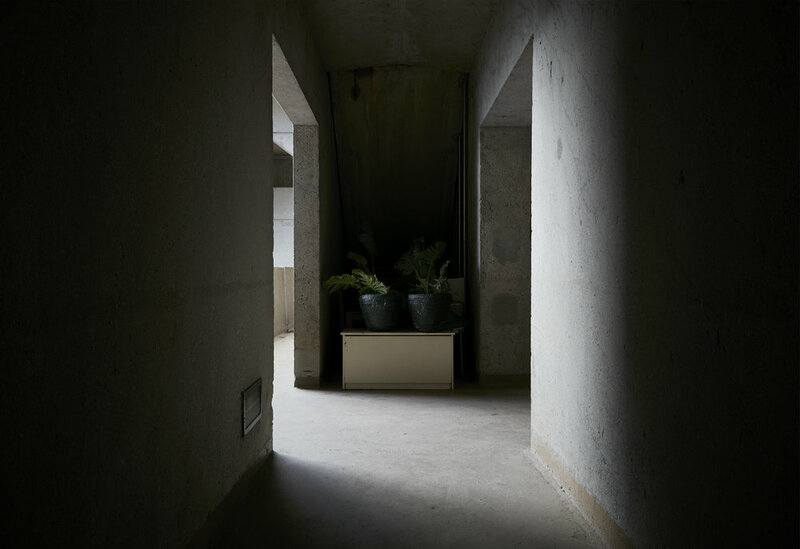 It shows the interior of a room at Asama House in Japan designed by architects Atelier Bow Wow. Here we clearly see how leaving a room as found can be not only be beautiful, but also very powerful in conveying the design and arrangement of the architecture. The Destroyed Room also for me gets to the heart one of the main challenges facing the photographer wishing to engage architecture in pictures. For me, the core concern is to find a balance between a straightforward visual description of a place, and the experience of being there. There is a tension in Wall’s photograph - between what we immediately see, and how we feel about what we see. 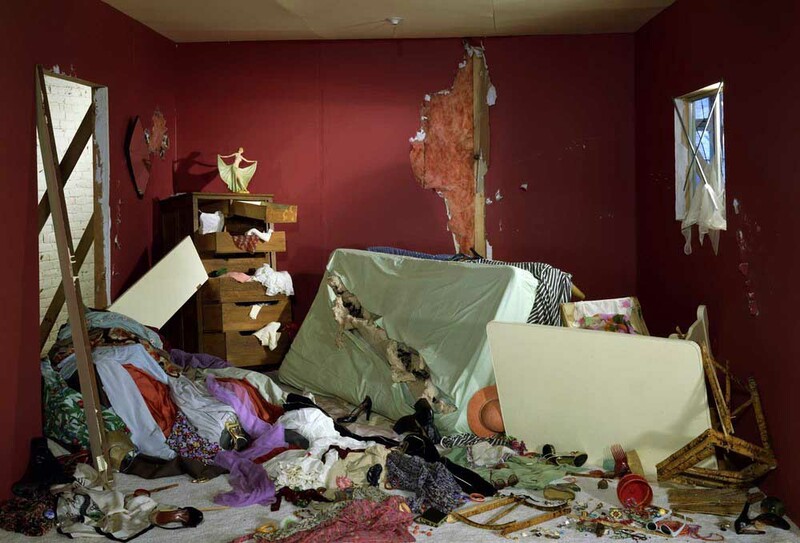 The Destroyed Room is on the surface a picture of untidiness, or chaos. But it alludes to something darker that may have happened in the room, which leads to an emotional response – perhaps fear, anxiety or sadness. In mainstream commissioned photography, we can engage this same tension just by simply thinking more deeply about these two aspects of picture making. A formal description of architectural arrangement on the one hand, and how it feels to be there, to be in the space, on the other. Finally, Wall’s photograph is helpful in the way that it draws attention to the process of picture making itself. It has an honesty in this regard, since it’s clearly made as a set, and not a “realistic” description of a room. All photography is in some way or other the very same process – it’s a subjective fabrication, not cool documentation, as Wall shows. As I’ve already mentioned, in mainstream architectural photography, people often appear placed as an afterthought. They’re introduced for scale – or decoration. 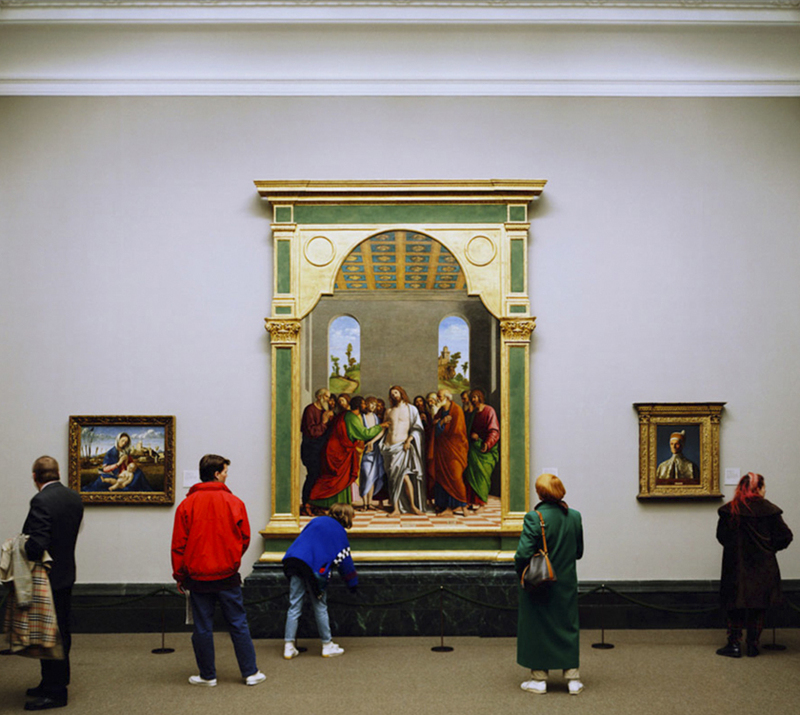 During the late 1980s and early 1990’s German Photographer Thomas Struth made a series of large-scale color photographs in famous European and American museums, where people are not incidental but integral to the places and spaces he was photographing. We witness people completely woven into the architecture – seen almost as pure as energy and movement in the space, as they move around and interact within it.In others, human presence in the image becomes part of the narrative itself. 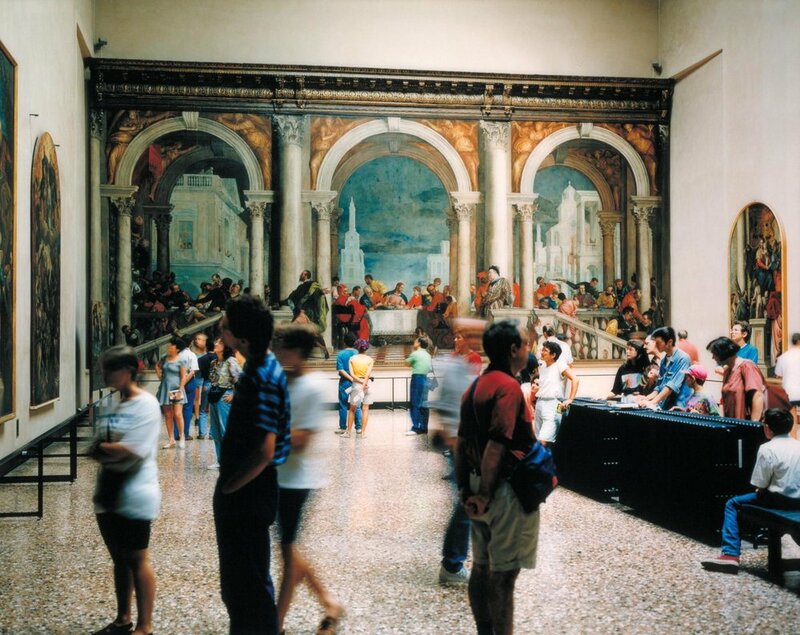 Here, in Struth’s National Gallery 1, a group of people stand in front of three Venetian paintings. Dominating the centre is The Incredulity of St. Thomas. The Renaissance altarpiece depicts the story of doubting Thomas, the disciple who lacked faith in the resurrection until he had placed his fingers inside Christ's wound. The colors and postures of the figures in the painting are mirrored by those of the gallery visitors. For example the girl in the blue cardigan bends forward, echoing the pose of Doubting Thomas as he extends his arm towards Christ. Although randomly observed, Struth makes people actors in the story of the picture – not just decoration. And finally, I also looked at Stuth’s family portraits – which have always intrigued me for their quietness and stillness. If you’re photographing a residential project on behalf of an architect, why not engage the residents? Ask them to pause deliberately from their day to day life? These portraits can reveal another layer to the nature of the the room, or space, and the life they’ve created within in it. Aside from inspiration from other contemporary artists, prior to making the photographs at Habitat 67, I also looked back at archival record. In Montreal we’re blessed with the Canadian Centre for Architecture – The CCA - which holds and curates an extensive archival collection of photography of architecture. I looked at the French photographer Lucien Hervé, who worked prolifically with Le Corbuisier following their meeting during the final construction phase of Unité d”Habitation in Marseille, France. What I like about this collection of Hervé’s work is it shows it’s not necessary to describe architecture only with a wide-angle view. Today, often the standard approach is to find a corner, place the tripod in it, and shoot everything in wide view. This can be helpful for description, but its less useful for saying anything about the experience of architecture. Hervé photographed in fragmented views – the record of the building becomes a story of moments, or experiences . These moments could be to do with light, or material, or people. And so to Habitat 67 itself. If you can bear with me a while, I’d like to briefly share the story of its creation with you. The majority of the archival record from the project is kept at the Canadian Architecture Archive at McGill in Montreal. I’ve included a few images here simply to allude to the historical record and the original ambitions of Safdie. There are one or two of these images framed on the wall in the studio here. Safdie had arrived in Montreal with his family from Isreal in the 1950’s, and went on to study architecture at University of McGill. He presented the first version of Habitat 67 as his final undergraduate thesis in 1961. It was his student blueprint for a new kind of dense urban living – a radical alternative to high-rise being pioneered by other contemporary architects – most notably Mies van de Rohe. Safdie rejected the Tower, or linear stacking of apartments. He felt there were other ways to achieve the same density, and also argued that Towers required unfriendly dark internal corridors accessed by central lift shafts. With Habitat 67 Safdie placed the tower on its side and deconstructed it – creating a variety of irregular and more generous common spaces, varied views to the outdoors, and with every apartment having its own garden or terrace. The other radical element was pre-fabrication. The concrete cubes and stairs at Habitat 67 were all constructed off-site and lifted into place by crane. After leaving McGill Safdie joined the offices of Louis Khan in Philadelphia as an intern. I attended a lecture last year in Montreal where he told the story of how at the age of 23 in 1963 he received a call from the head of the World Fair planning committee to fly by light aircraft to Ottawa with his model and drawings of Habitat to present his proposal to the then Prime Minister, Lester B. Pearson. Following his presentation, Safdie was given the green light to build, in spite of his youth and inexperience. He was just 25 at the time. An opportunity he simply described as a “an amazing fairy tale”. And so the photographs I've made - which I'm going to scroll through without much further commentary. So I’ve set out to explore Habitat 67 in the context of the thinking I’ve laid out. It’s my conviction we need to review the way we describe architecture in pictures. Architectural photography needs to concern itself more deeply with human experience, to be more alive to the tension between a visual description of architectural arrangement and the feeling of being at a place. If we allow ourselves, photography of architecture can also be more open to the beauty of what is found. We must resist the temptation to always to tidy up our photographs. And finally I would argue strongly for the idea of revisiting architecture with a camera. New architecture clearly needs to be recorded at the point of completion. The trouble with this is the building hasn’t had a chance to live much. Why not adopt the habit of revisiting, to go on exploring the richness of how buildings are used, lived in and adapted over time.